The Advent wreath is circular in shape. The circle is a symbol of eternity. It has no beginning or end, reminding us of God’s unending love for us. It is made of evergreens, which are a sign of life in an otherwise lifeless winter. They point to new life and the hope of eternal life that we find in Jesus Christ. They also remind us to pray for the coming restoration of all of God’s creation. The five candles contrast darkness and light. They are lit in succession, one more each week as we count the Sundays in Advent, waiting for Christ’s birth. We are also reminded of God’s chosen people, Israel, who waited thousands of years for the Messiah. 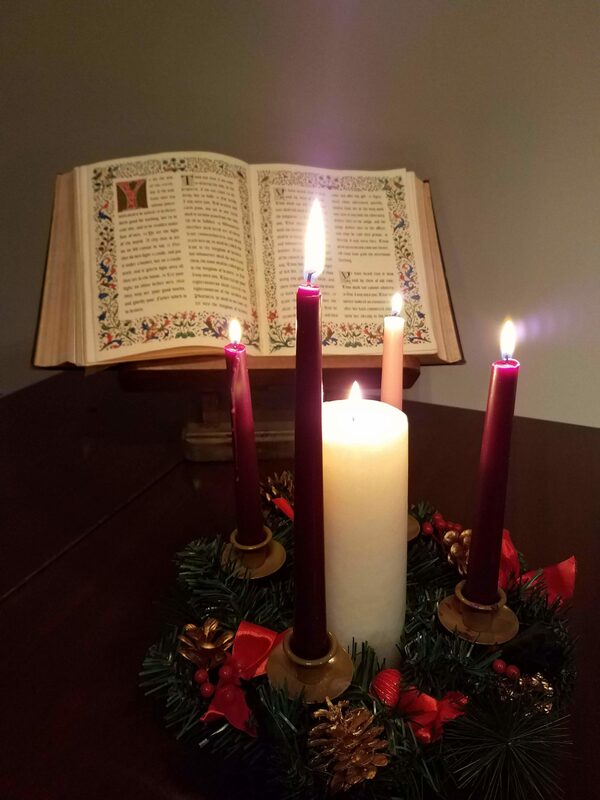 On Christmas Eve or Christmas Day, the fifth candle—the Christ candle—is lit. Jesus is the light of the world, and the darkness has not put it out. The full blaze stands for the fulfillment of the promise. Three of the candles are traditionally purple, the color of royalty honoring Jesus Christ, the King of Kings. There is also a pink candle, lit on the third Sunday to represent joy and to mark the breaking of the fast that was kept in old days. It suggests the Rose of Sharon. The Christ candle is always white and is larger and taller than the others. It is placed in the center of the wreath, in the place of prominence. We will light a new candle and focus on a different theme each Sunday leading up to Christmas: Hope, Love, Joy, and Peace. And finally on Christmas Eve, we will light the Christ candle.